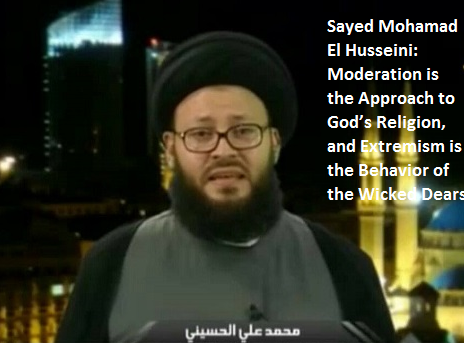 • الموضوع : Sayed Mohamad El Husseini: Moderation is the Approach to God’s Religion, and Extremism is the Behavior of the Wicked Dears . Yet unfortunately, there are some people who believe that such religious discourse is a sign of weakness and is of no relevance to them. They insist on evil practicing, injustice, killing the innocents, abusing children and women and exiling people as well as practicing oppression and tyranny. They do not obey righteousness and do not believe in values of love, peace, tolerance and reverting to right by means of reason, wisdom and religion. They have also abused some exceptionally aggressive religious texts and made them go along with their evil deeds; building on the only perspective they understand that is the logic of power.